This is the 5th edition of the 2018-19 Young Bucks Tracker. Welcome back to the Bledshow. It’s not that Bledsoe is having a bad season for Milwaukee. He’s shooting 51.9 percent from the field, which would be a career high. He’s making 36.0 percent of his 3-point attempts (last season, 34.7 percent). His rebounds (4.4) and assists (5.9) per game are both up from last season. But Bledsoe hasn’t been scoring — or shooting — as much as he did in his first season with the Bucks in 2017-18. After being acquired from Phoenix last season, Bledsoe took 13.4 field-goal attempts per game and averaged 17.8 points. Heading into this past week’s games, he was averaging 11.1 shots and 15.0 points. In a win over Chicago on Nov. 28, Bledsoe attempted just three field goals (and took no 3s for the first time this season). That all changed this past week. 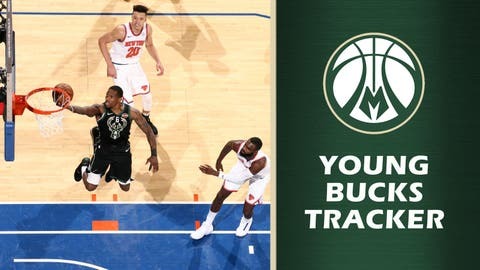 With Khris Middleton benched the latter part of a loss to the Knicks on Dec. 1 and missing Wednesday’s win over Detroit for personal reasons, Bledsoe took over. Against New York, Bledsoe put up a season-high 18 shots — and made 11 (61.1 percent) — scoring a season-high 27 points. He also had four rebounds, seven assists and two steals. Four nights later he matched his season-best, once again notching 27 points (on 10-of-17 shooting, 58.8 percent) in just 26 minutes against the Pistons. In that game he had three rebounds, four assists, four steals and a +14 box score plus/minus. Those two games raised his scoring average one full point and his shooting percentage from 50.6 percent to 51.9 percent. Just call it the return of the Bledshow. — This week’s Giannis Antetokounmpo stat: He leads the NBA with 104 dunks — four more than Utah’s Rudy Gobert. According to NBA analyst Kirk Goldsberry, Antetokounmpo also leads in unassisted dunks with 48. Gobert is next … with 19. — Malcolm Brogdon scored 36 points in two games, making 13 of 24 field-goal attempts (63.6 percent), including 6 of 9 from 3. He also went to the free-throw line twice and sank both. Brogdon leads the NBA in free-throw percentage (97.4) and is fourth in 3-point percentage (49.4). — Sterling Brown is earning more playing time. The second-year guard played a season-high 21 1/2 minutes against the Knicks and had eight points and three rebounds, then 19 minutes vs. Detroit, with 11 points and three boards. He made 7-of-10 shots, including 4-of-5 3-point attempts, in the two games. — After being inactive for Milwaukee’s first 22 games, D.J. Wilson played 5:37 — his most minutes in an NBA game since Feb. 28 — against the Pistons and tallied a career-high seven points, hitting two 3s, and a steal. — Sent down to the G League for one game, Christian Wood had 21 points, nine rebounds and three blocks for the Wisconsin Herd on Tuesday. Wood then played nearly 7 1/2 minutes for the Bucks on Wednesday vs. Detroit and had six points and four rebounds.